It is premiere week of Season 2 of Last Chance U! 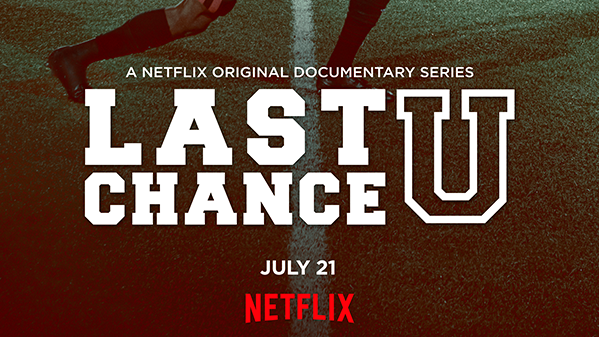 The premiere of Last Chance U season 2 comes out Friday, July 21! I will be in New York City for show festivities – the whirlwind has begun! This week makes me reflect on the past year and how grateful I am to have been given this opportunity. Sometimes I wonder, “why me?” There are counselors all over the country doing exactly what I do. Why was I the one given this amazing opportunity? I don’t know the answer to that. But I know that I will not waste it. A year ago I was buying pencils from Dollar General with my debit card and now I have 3,022 fantastic pencils sent to me from all over the world by people who were inspired by my job and cared about the well-being of my athletes enough to mail me pencils. I think that is amazing! One fan was so perceptive that he noticed I was sitting in a pretty old, worn out chair – and he mailed me a brand new, fancy desk chair! You have no clue how happy that made me. This show and my work may have inspired millions but you have no idea how much YOU have inspired me! Just the thought of knowing that humans still care about other humans – enough to take time and effort to mail pencils, chairs, coffee mugs, paper, shirts and just cards with sweet messages. That is inspiring. Your stories are inspiring. Your efforts are inspiring. And I promise you, I will not let you down! Here is to a Happy Premiere Week everyone! I truly hope you enjoy season 2! Congrats on the new career path. I wish you all the best in your new endeavors. I could feel every ounce of your frustrations in season 2 and totally think this is best for you and your daughter! Best of luck! Robert Seasting here. I am a professional engineer from Vancouver Canada. Like so many others, I really enjoyed the Last Chance U 2nd season. I did something I have never done before. I binged watched it. That is not my style but after watching Season 1, but curiosity got the better of me.I was disappointed that you left, not because you are starting out a new career but because what happens if Netflix opts for a 3rd and 4th season. That would be a lost opportunity for you and you were by far everyone’s favorite person in the series. You definitely made the show interesting for both seasons and I would not have watched it completely if not for you. You really brought out the characters of the players and the school. You brought a humanity to the show that the football coaching staff completely missed. They were more about yelling and intimidating rather than developing. That being said and regardless of Buddy’s aggressive nature, he is obviously a coaching genius. The series does not get a handle on that, Too bad because that would have been interesting to see what makes him so different. Sad in the 2nd season to see him start off so well and get so ridiculously aggressive by the end of the season, particularly in playoff season. Feel a bit sorry for his family. Anyway… all that to say that I hope we see a few more seasons of this program and that they convince you to come back in some sort of valuable role. I see IMDB lists you as an actress. who knows… maybe one day. My fiancé and I just finished season 2 of Last Chance U. Not going to lie; I think the hardest part of watching, when it came to those who moved on from EMCC, was when you left. I’m so glad though that your passion led you to this though, because I’d love to continue to follow and learn from your journey. I’m a counselor as well, who has always dreamed of helping out athletes as you are now, so it is encouraging and inspiring to see how far you’ve come. I recently moved from Texas to Louisiana to start my next chapter with my fiancé, which inherently led me to making a change in my career within the counseling field. I love being a school counselor; athletes are just my niche, so I hope to be able to get into that some day. Thank you for being a role model to someone like me, who is feeling a little lost in a new place, a small place at that. If you ever make a trip to Texas or Louisiana, please let me know, as I could always use a mentor. So happy you chose to follow your dream. I know you have heard it a milliion times but we just have to make sure that you understand how you were the real difference and a hero at EMC. Thank you! I don’t know if anyone cared more about those athletes than you did. To see you pour out of yourself and into those young men without reservation was everything. YOU were their last chance and we pray that the next group of young men will have someone to care half as much as you did because it’s going to be a pretty big role for the next person to fill. The late Maya Angelou said that your legacy is the lives that you touch. You left a legacy because you touched many hearts and lives on and off the field. My husband coached high school football for years until our youngest sons senior year. He had committed early to a D-1 school but they rescended their offer at the end of football season his senior year. By then, all the other schools who were once interested had moved on. He was left without an offer and our family was devastated to say the least. But he was able to go to our local JUCO (Riverside Community College) which serves the same purpose as EMC for many athletes. So this show hit home and was personal. After binging on both series, I was able to really appreciate our son’s journey and the opportunity that the JUCO offers because I realized that there’s a very slim chance for so many. The experience was humbling but we are grateful that he was able to transfer to UMASS this summer and is expected to play this coming 2017 season. As a mother, it was good to know that there are good caring people who genuinely care for our student athletes. You gave hope to some parent that perhaps at least one person other than a coach is caring for their child who is miles away from home. God bless you for the impact you made and may he be with you on your new journey. You are a good person. Sometimes too compassionate, but that is your passion. You have a lot to offer. I hope you land a D1 position soon! – OR your speaking engagements skyrocket to 100’s per year! Girl.. YOU ARE AMAZING! I cried watching you leave. I am a single mom of a little baby girl who will be 2 in September and do it all on my own. You truly are an inspiration. There are so many things i see in you that i see in myself as well. But you have the total package. Thank you for doing what you do for these students and being their “mom”! watching this series made me feel like i was there with you cheering these boys on every step of the way. i shed tears and i got excited and cheered. Its crazy! You have my vote for anything you do! Congrats on your business! Stay Strong, Humble, Positive & Caring! I hope these boys stay in touch with you! Love you always and I don’t even know you! “Last Chance U” definitely showed how much you care for those individual students. I hope your business venture goes well, and I hope the show helps you develop the personal life you said you are missing. Don’t forget that taking care of others is great, but once in a while, you have to take care of you as well. I would like to see more HS guidance counselors like you. There is a podcast out there by a Malcolm Gladwell called revisionist history. If you get some windshield time, download these three to be exact: Carlos doesn’t remember; Food Fight; and My Little Hundred Million. You change lives for the better and in turn make the world a better place. If someone put a gun to my head and told me to do what you do, I’d have to tell them to pull the trigger – there’s no way I could do it. The depths of your patience, love, and understanding, in the face of constant push back, is stunning. It is also inspirational. So it wasn’t until just a couple of weeks ago I even wanted to watch Last Chance U. I kept seeing my husband watch and talk about it and I even sat in on a few scenes. I too live in the backwoods of Mississippi and Scooba is not but about 45 minutes from where we live. For me it wasn’t about the football it was about the relationships and the changed lives that you had a part in that was so interesting. You have a God-given talent to find the good in everyone and that is what will make you successful. Cheers to touching and changing many, many more! From one Mississippi girl to another, God Bless!